Once downloaded, open the file. An eclipse folder is created. Move it somewhere safe. In that project, we want the Demos folder. When asked about a workspace, indicate a new workspace or any existing one. Go to menu File > Import > General > Existing projects into workspace. Browse to the project (Demos folder), Eclipse should recognize the project. Extract those zip file, and copy gs-algo-1.2.jar, gs-core-1.2.jar, gs-ui-1.2.jar to the lib/ folder of the project. In Eclipse, select the project in the right panel and refrech the project (F5 key). Right-clic on the project (gs-talk-simtools), then properties, then Java build path (left panel), then libraries (right panel), then clic the Add jars button, and select our 3 jar files in the gs-talk-simtools/lib folder. 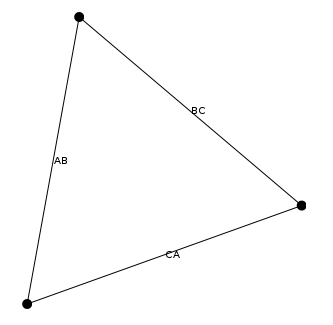 graph.addEdge("BC", "B", "C", true); // Directed edge. Maven : mvn exec:java -Dexec.mainClass="org.graphstream.demo.tutorial1.Tutorial1"
Each node, edge and attribute is identified by an unique string. The node and edge elements are created for you. You can change the graph this way at any time. Each change is considered as an “event”. The sequence of changes is seen as the dynamics of the graph. There are many other ways to modify the graph. Data stored in the graph, on nodes and edges, are called “attributes”. An attribute is a pair (name,value). But you can add any kind of data on each graph element. However not all attributes appear in the viewer. Be careful: indices remain the same as long as the graph is unchanged. But as soon as an addition or removal occurs, indices are no longer tied to their old node or edge. Each node and edge allows to iterate on its neighbourhood. Toolkit is a collection of often used methods and small algorithms. Each graph is a source of events. You can connect to any source using the Source.addSink(Sink) method. You can choose to receive only events concerning the graph structure with addElementSink(ElementSink). 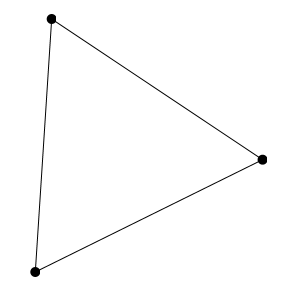 Elements are nodes and edges. You can choose to receive only events concerning data attributes stored on elements with addAttributeSink(AttributeSink). A Sink is only an empty interface inheriting ElementSink and AttributeSink. A source is an interface that only defines methods to handle a set of sinks. As the graph is also a sink, you could use these methods to create the graph. But a better way is to send graph events using an existing source, like a file. Few graph file formats are dynamic. GraphStream provides a format named DGS that allows to store and load dynamic graphs. an add a node and ae an edge. ae "AB" "A" > "B" adds a directed edge. cn, ce and cg change or add one or more attributes on a node, edge or graph. dn and de allow to remove nodes, edges. Each change in the graph is an event. However you may want to define a notion of time, and group some events as occurring "at the same time". You can do this using a step. The DGS notion for steps is st <number>. The ability to remove nodes and edges make the format dynamic. We will now read this file. However this will "play" all events as fast as possible. We have no control over the speed at which events occur. This form of reading is an utility method of the Graph interface allowing to read static graphs from all the supported file formats. We read the file event by event (line by line in the file), however it still does it as fast as it can. Note the line while(source.nextEvents()); that does the job. Also note that we have to call the begin() and end() methods before and after reading to cleanly open and close the file. The graph is automatically reshaped for you. However you may want to position nodes by yourself. You can now run the program anew.